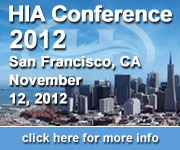 Please join us in San Francisco, CA this November for the 2012 HIA Conference! Your early registration is appreciated and helps with event planning. This year the HIA Conference will be directly after the Green Festival, which will be held November 10-11, and prior to Green Build Expo, which will be held November 14-16. Remember to experience the great speakers and networking of HIA 2012, click here and register today and save $100 over the door price.